Saturday I felt like I was coming down with some sort of flu bug. Chills, sweats, a rager of a headache. When the baby went down for a nap I went upstairs to take one myself (not technically a Nap Attack, because the husband was aware and in support of this escape). He agreed to stay outside with the 4-year-old. Trying to take advantage of a child’s nap time to squeeze in a nap for yourself can be stressful. You know if you don’t fall asleep immediately, chances are slim that you will actually clock enough z’s to make a difference. And then you’ll just be pissed when the child wakes and you have to get up, probably worse off than you were to begin with. So I was straining to fall asleep. Willing myself – please oh please self, just relax, ignore the pain, go to sleep. This type of rest is no fun. Too much work involved. You can probably pull a muscle. Finally, I started to drift into that peaceful neverland. A sea of calm took over. This is just what I needed. Ahhh. She knew I was taking a nap. Her father was two inches from her outside. But instead of asking him to help with this life-or-death request, she opted to march herself upstairs and ask sleeping mommy. I should note that this Saturday nap interruptus was on the heels of a challenging Friday with this child. She pushed damn near every one of my last buttons with her newfound love of sassing and ignoring discipline. So I was in desperate need of this break for more than one reason. Then I laid there. Thinking about how I would write a blog post about how parenting is just give, give, give. Like squeezing a sponge until you can’t possibly wring out another drop. Does it ever let up just a little? A couple hours later we had to go get my car from the shop. Just a standard maintenance check – don’t you worry. I hadn’t showered in two days, I was sweaty and dizzy, and I was still wincing from my failed nap attempt. Somehow I made it home. My husband had wisely taken the kids to the store in his car so I had a few quiet moments alone. I used them to sit in my stink and fume about the unfairness of life. That’s right, I left the house with that hair. At breakfast my daughter had attached a pen to my hood. 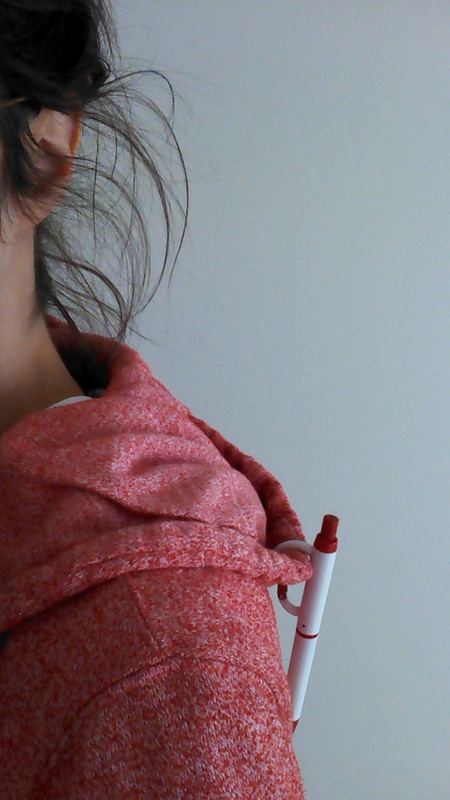 This little act of ingenuity brought her great joy because – duh, a pen…on a hood? Hil-ARious! I forgot about it and walked around all day with that pen hanging off my hood, including at the car dealer. That guy probably thought I was bona fide crazy, stinking up the joint in my sick stupor with mangy bedhead, death breath, and a writing utensil within arm’s reach for emergencies. I couldn’t help but laugh. Dang it kid, why you gotta be so awesome? Totally ruined my plans to sulk and feel sorry for myself. Also? Life was so boring before you were around. Now please go back and read this post title and give me bonus points for my witty wordplay. Three year olds are pure H-E-L-L. But Four year olds are clearly citizens of the underworld and are minions sent by the Two year old demons to finish squashing our spirits. Children are wily about finding us in our rare moments of peace and SQUASHING our sense of independence. But I hear they leave the house eventually. In 20 years or so. I think I have 17.5 years until I can nap in peace again, but who’s counting.